Corporate social responsibility (CSR, also called corporate conscience, corporate citizenship, social performance, or sustainable responsible business), is a form of corporate self-regulation integrated into a business model. CSR policy functions as a built-in, self-regulating mechanism whereby businesses monitors and ensures its active compliance with the spirit of the law, ethical standards, and international norms. The goal of CSR is to embrace responsibility for the company’s actions and encourage a positive impact through its activities on the environment, consumers, employees, communities, stakeholders and all other members of the public sphere. The term “corporate social responsibility” came into common use in the late 1960s and early 1970s after many multinational corporations formed the term stakeholder, meaning those on whom an organization’s activities have an impact. CSR is titled to aid an organization’s mission as well as a guide to what the company stands for and will uphold to its consumers. Here at Tony Gilham Limited, we are fully committed to our community and the environment both through our place of work and our racing team. As such, we work closely with our clients, employees, members of the general public and our community in order to show our commitment to our CSR policies. 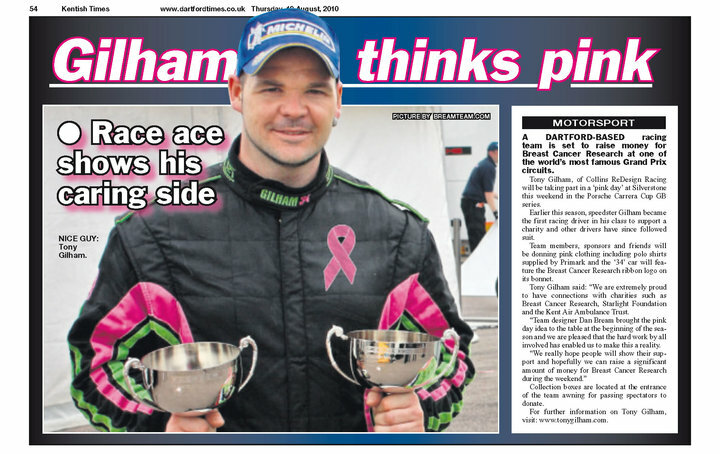 We are extremely proud of the role that we play in regularly supporting Cancer Research UK as our race car carries the ‘pink ribbons’ and for the past few seasons, we have held a ‘pink day at a designated race meeting to both raise some much needed funds and awareness. This high-profile event took place at Silverstone Circuit in 2010 and Brands Hatch in 2011. 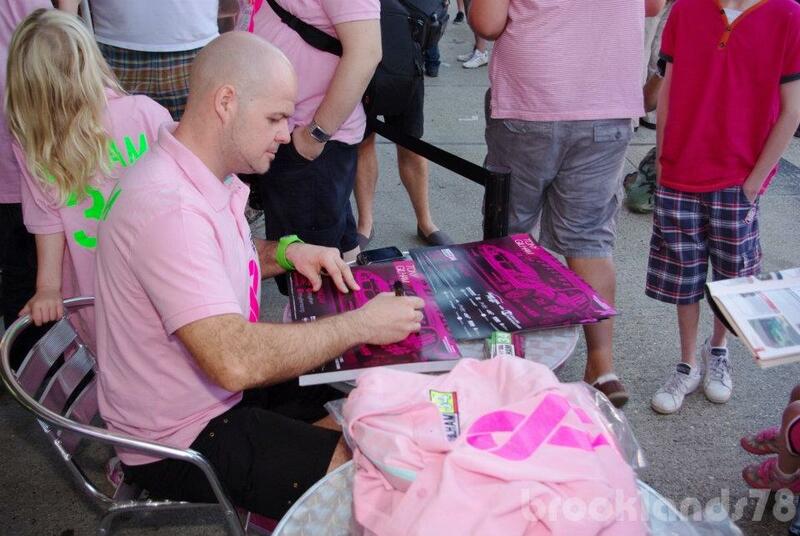 Every team member, sponsor, plus family and friends all wore something pink and the events were covered and praised by many media channels. During the entire season, the team awning has provided collection boxes for the Cancer Research UK as well as leaflets to raise awareness. We have also added a fundraising link on our website to encourage donations from those that have not been able to make it to a race weekend. We have received many emails commending our accessibility on race weekends (see page 10 for details), but one that gave us the most pride was a note from Daniel-Scott’s parents (Knockhill, Scotland), who were in absolute admiration, after the 6-year-old with autism came into his own around the brightly coloured car. 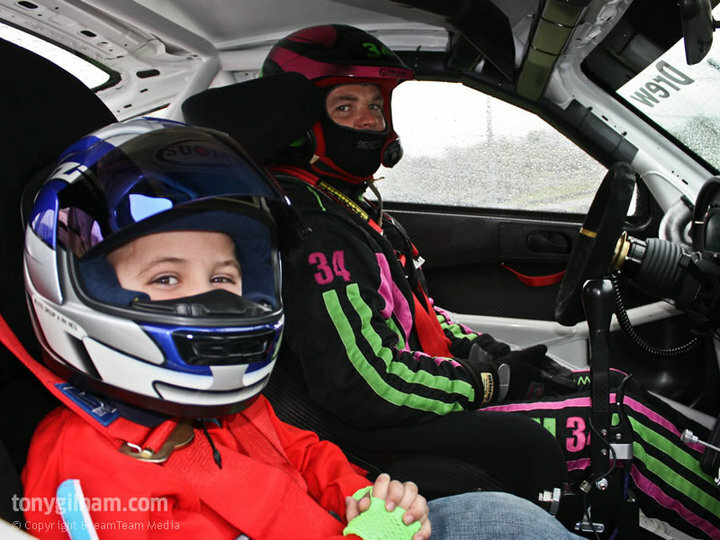 Seven year-old, Drew James who was diagnosed with acute myeloid leukaemia was granted a wish by the Starlight Children’s Foundation charity to drive in a fast car! Tony and the team helped by providing the young racing fanatic with exclusive hot laps of the Brand Hatch circuit during the racing weekend in April 2010. In October 2009, we supported the ground-breaking ‘Street Violence Ruins Lives’ campaign, Rob Knox Charity Dinner at The Valley, home of Charlton Athletic Football Club which was attended by over 400 people and covered by the Daily Mirror and Sky Sports. Our invitation and participation in the Time Attack event at Brands Hatch in June 2010 saw us compete in a Porsche 996 turbo, which was the fastest Porsche on track whilst supporting Help for Heroes. Safeguarding the environment is a high priority at Tony Gilham Limited and we are taking responsibility for the mark we make on the environment. We are committed to operating in a way that is mindful of the demand on our planet’s limited resources. We are actively committed to a number of key initiatives targeted at reducing our impact on the environment including reducing our levels of energy consumption (including the use of renewable energy sources), aiming for a paper-free office culture, increasing the levels of recycling, ensuring that all waste is disposed of safely and increasing the use of biodegradable materials. The duty of care is a law which says that you must take all reasonable steps to keep waste safe. If you give waste to someone else, you must be sure they are authorised to take it and can transport, recycle or dispose of it safely. The duty of care applies to anyone who produces or imports, keeps or stores, transports, treats or disposes of waste. Waste is classified as anything you own or produce, and you want, or are required to get rid of. Controlled waste is household, commercial or industrial waste. It can be from a house, school, university, hospital, residential or nursing home, shop, office, factory or any other trade or business. It may be solid or liquid, scrap metal or a scrap car. It does not have to be hazardous or toxic to be a controlled waste. The duty of care is about making sure waste does not harm the environment or human health. Anyone handling controlled waste must make sure it is handled safely and only passed on to others who are allowed to receive it. ● check the person you transfer the waste to is properly authorised to accept it; for example, that they hold the necessary permit or registration. ● make sure each transfer of waste is covered by a waste transfer note, or a consignment note if the waste is hazardous and that this adequately describes the waste. ● make sure the waste is safely contained and that it is not able to escape control. You may be asked to prove you are an authorised person when collecting or transferring waste to someone else. You can do this by using your registration certificate or authorised copy card. As such, we are registered with the Environment Agency as a hazardous waste producer.